Bariatric surgeries can injure kidneys by raising urine oxalate excretion. This latter causes kidney stones, and raises risk of acute and chronic oxalate nephropathy. Overall, their benefits far outweigh these risks, especially when patients and physicians take proper precautions.But risk lurks as if in shadows, and waits on accident. The patient here inadvertently raised her risk of injury. Like all instances this one is just that: Opportunity to inspect the details of an undesired outcome so as to reduce the chance it will happen to others. The kidneys of anyone with increased urine oxalate excretion could be injured as her’s were, so common are the causes, so seemingly innocuous. 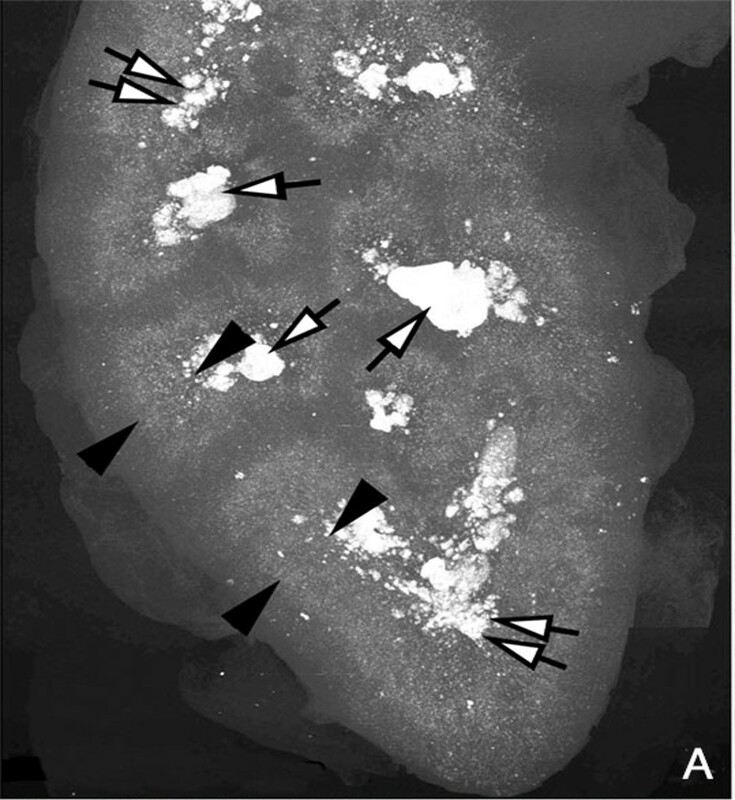 The high resolution scan of a kidney from a child with primary hyperoxaluria shows selective crystal accumulation in a narrow stripe between the tips of the black arrowheads. Through this strip run the terminal portions of the proximal tubules, where water extraction and oxalate secretion create highest supersaturations. A highly educated woman, presently early middle age, had a form of Roux en Y as noted on the figure. She lost appreciable weight, and maintained that loss over 14 years. Kidney function (eGFR) measured casually in the course of ordinary health care was stable and normal from 2010 through 2014, and had been, presumably, since 2000. In 2014, aiming at optimal health, she changed her diet to mainly plant foods. Some of the foods in this new diet, such as spinach, had very high oxalate content. For someone otherwise perfectly normal, this diet need pose no special risk. Given her bariatric surgery one might, perhaps, have wanted to measure urine oxalate excretion as a precaution. But mere diet change can seem so benign. A casual measurement at the end of 2014 revealed a fall of eGFR to about 75. Perhaps because small changes in serum creatinine easily escape notice, this did not trigger a response at the time. However ominous it may seem in retrospect, I suspect that in the course of routine care it appeared a random fluctuation. But because high urine oxalate from diet alone can cause progressive fall in renal function with cortical calcium oxalate crystal deposits, this one measurement may indeed mark the beginning of kidney damage. Because bothered by a sense of fluid retention, she was offered lisinopril and the diuretic lasix in 2015. Lasix is not an ideal drug because kidneys adapt to it by increasing proximal and distal tubule sodium retention, so when stopped rebound salt and water retention can continue for weeks, and swelling exceed what was there before the drug was ever taken. Even so, its use is very common, and in most people without serious risk. Because her blood pressure was not high, the lisinopril is harder to understand. As I shall show later on, lasix and lisinopril could have raised her risk for kidney damage from crystals, the former because of increased proximal tubule reabsorption, the latter because of reduced glomerular filtration rate. Also in 2015, she began Miralax, a widely used polyethyline glycol laxative. A bit later she added Dulcolax (bisacodyl) that acts differently from Miralax in directly stimulating colon motility. Linzess, a drug that increases fluid secretion by affecting ileal cell transport, was added in 2016, so all three acted through 2016 and 2017. By depleting the body of sodium and water, these drugs would also raise proximal tubule reabsorption and lower glomerular filtration. So their risks added to those of the lasix and lisinopril. Looking back, what has happened can seem inevitable. But others might have done the same as she did and escaped kidney injury depending on accidents of intake and habit. So rather than say her medications and diet caused kidney failure, say they posed potential risks that in this one instance culminated in kidney failure. Even so, this instance points out we should be wary going forward. Kidney function fell progressively throughout 2016 and 2017, so by the end of 2017 she was in kidney failure. The drugs were discontinued and a kidney biopsy performed. Subsequently, kidney function rose, as the graph shows. The tissue is from the cortex of the kidney, where glomerular filtration occurs. The large round balls not circled in black are glomerulae (upper left panel). Black circles highlight proximal tubules filled with crystals, clear, sharp edged, and obviously different from cells. The black plate (lower left panel) replicates the one above it in polarized light so the crystals shine – this proves they are calcium oxalate (birefringent, for the experts here). The first two tiny squares at the upper right show a crystal in a single proximal tubule cell and next to it a polarized view. The high power tiny square next in line shows a thin crescent of crystal in the lining of one proximal tubule cell (white arrow), facing into the tubule fluid. Last in line to the upper right is a polarized picture showing the crescent – at the white arrow (squint to see it!). 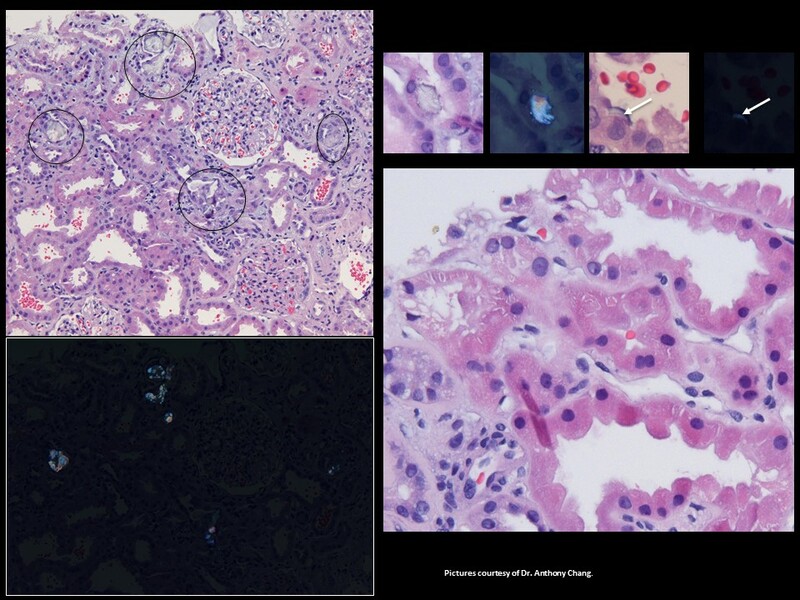 The expert renal pathologist who made these pictures for me pointed out the crystals could seem benign because the tissues show little if any scarring. But if you look close, as in the lower right large plate, the cells of the proximal tubules are irregular, their nuclei (dark inner circles) often missing. This means injury and regeneration, with risk of later scaring. This is not the time or place for a disquisition on crystal mediated cell injury. But the outlines are easy to state. The crystals probably form in the cell membrane, as in the thin crescent pictures. Cells incorporate the crystals and seek to destroy them or move them out the other side, into the interstitial space. This whole process consumes energy and activates pathways in the cells that can injure them. Cells might safely dispose of few and scattered crystals. Perhaps that happened all the years when kidney function was normal. We cannot know. 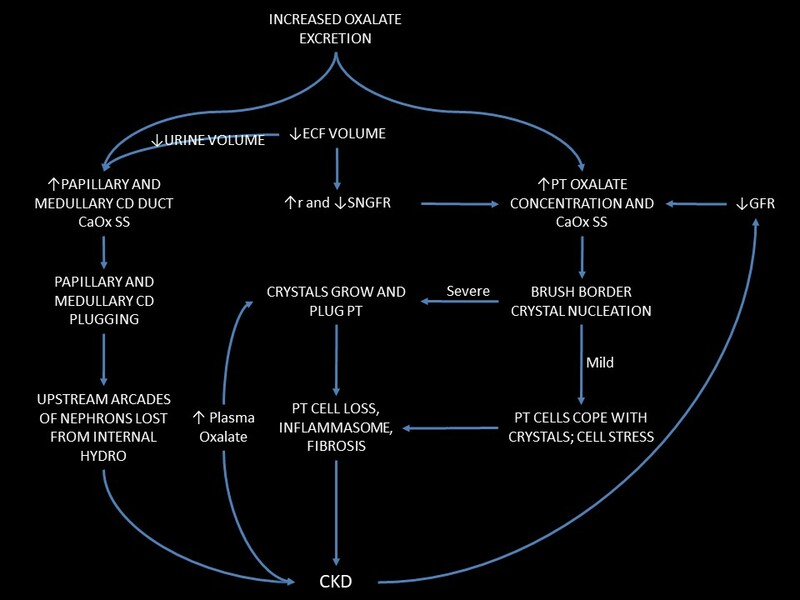 Presumably the high oxalate diet and medications increased crystal formation and forced cells to cope with more and more crystals that damaged them and caused to acute kidney failure. We can assume this as we found crystals and cell injury. As the drugs wore off, kidney function rose. Months after the biopsy I found urine oxalate was 87 mg/d – a high value. Her blood pressure 130/80. Given what we know, I began a high calcium diet with avoidance of high oxalate foods. What Makes Calcium Oxalate Crystals in the Kidney Cortex? Anyone who has even glanced at this site knows about supersaturation and how calcium oxalate crystals form in the final urine. It is the central paradigm of stone formation, and measurement of supersaturation a prime guide to stone prevention. I have shown over and over that the main force that produces supersaturation in urine is water conservation itself, a prime function of kidneys that protected us as a species throughout our long evolution in Africa. Thence the central importance of hydration in stone prevention. Elsewhere on this site I have detailed how oxalate is secreted by kidneys from blood into the tubule fluid that kidneys process into the final urine. This occurs only in the proximal tubules, the parts of the nephrons directly following filtration at the renal glomerulae. Oxalate can also move back into the blood after it is filtered – the process of reabsorption. Kidneys of normal people filter oxalate and then excrete most, perhaps partly reabsorb some, rarely secrete any. But in people with high urine oxalate excretion, like primary hyperoxaluria (PH1) or bariatric surgery, secretion is prominent. What follows is difficult, a detailed look at secretion as we measured it in humans. You may skip it and still get a lot out of this article, or read it to get a deeper look. From now on I will write ‘proximal tubule’ so often, I introduce the abbreviation ‘PT’ to save letters. Because kidneys are the main organs to remove oxalate from the body, as kidney function fails (creatinine clearance, upper left panel) plasma oxalate concentration rises. Circles are ordinary stone formers and normal people. The effect is small as they have good kidney function and low urine oxalate excretion. The other symbols are all from PH1 patients. They develop kidney disease so their kidney function falls, and they produce excessive amounts of oxalate in their livers. Plasma oxalate rises by 10 to 30 fold, and even the blood can become supersaturated with calcium oxalate. 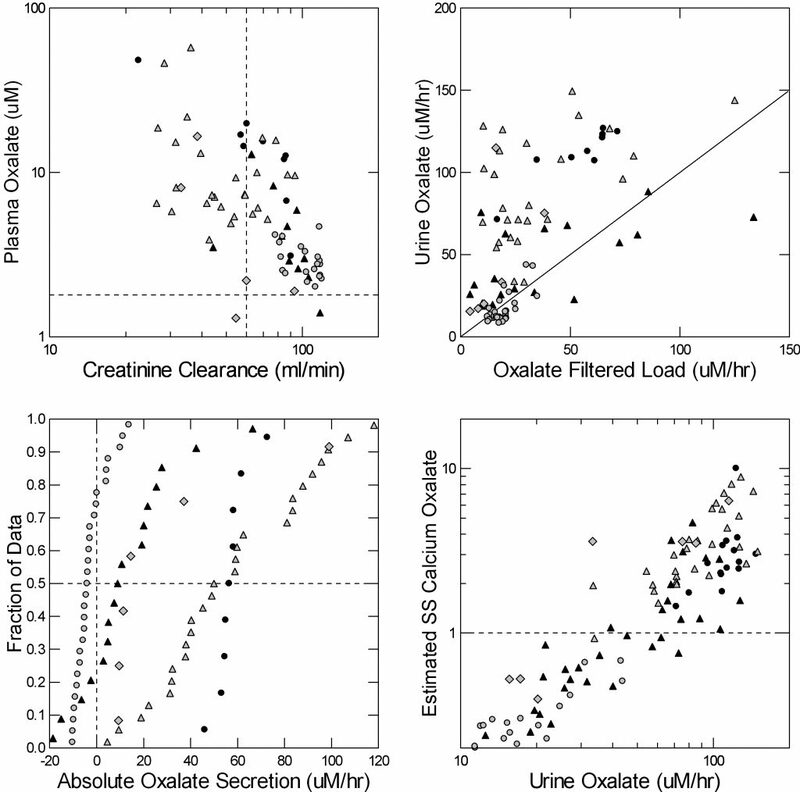 As the filtered load of oxalate rises, from rising plasma oxalate, urine oxalate rises way above what is filtered. See how the points in the upper right panel are above the diagonal line of identity? All that is secretion, in the PT. Normals and common stone formers (open circles) have little or no secretion; their points line on the diagonal line. The lower left panel shows the secretion rates directly. On the horizontal axis secretion is points above 0, reabsorption from filtrate back into blood is below 0. Normals mostly filter oxalate and reabsorb it back (round circles). All of the PH1 patients secrete except for scattered few who have had a kidney transplant – black triangles. Those with severe kidney failure waiting for a transplant (black circles) secrete most reliably. No oxalate can get into the urine except by going through the PT, and once oxalate leaves the PT it can go only into the urine. So to say urine oxalate rises is to say that the sum of filtered load and secretion rises. If there were no oxalate secretion, kidneys would excrete exactly as much oxalate as they filtered, so as filtration rate fell plasma oxalate would rise. Secretion reduces that rise because it provides an alternate pathway to move oxalate into the proximal tubule lumen. This matters because as plasma oxalate rises plasma itself can supersaturate with calcium oxalate and crystals form within the body. 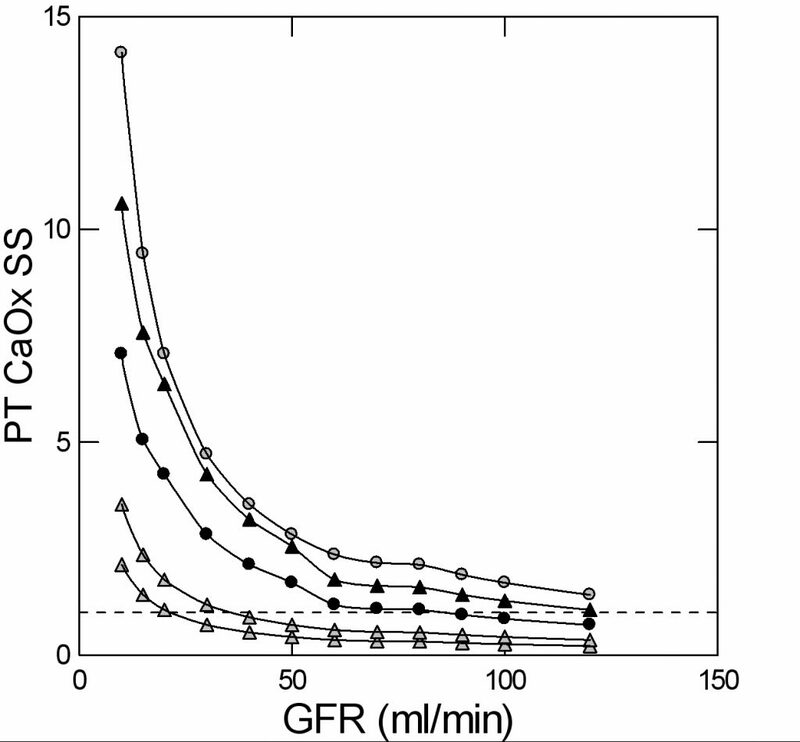 As is evident from the upper left figure in the four plot just above, plasma oxalate rises as g falls, meaning secretion cannot compensate fully and filtered load of oxalate must rise. The bottom right panel is the payoff. As urine oxalate excretion rises, calculated PT supersaturation with respect to calcium oxalate rises smoothly. The axes are in logarithms because of the large range of values. Normals and routine stone formers have no appreciable PT supersaturation; they lie in the lower left corner of the graph. But when urine oxalate rises as high as about 60 micromoles/hour (about 120 mg/d) saturation rises above 1 (the dashed horizontal line), and this means crystals can form in the proximal tubule. In PH1 this is well known, and leads to kidney failure. In gastrointestinal diseases like bariatric surgery that raise oxalate absorption into the blood, urine oxalate can rise as high as in PH1, and PT supersaturation rise enough to create crystals, as in our patient example. Let me be clear here: PT supersaturation behaves differently from urine supersaturation. The latter depends on urine flow rate that provided water to dilute excreted calcium oxalate salts. The former depends on glomerular filtration that provides water to dilute the oxalate coming in from filtration and secretion. Water intake does not affect glomerular filtration. Harder than what you just read, I wrote this for those with a quantitative bent, some algebra, and a lot of patience. Skip down to the next section and take my word on it, or read it through and follow the logic. dissolve that oxalate is just the glomerular filtrate. So if oxalate enters at some rate (mg/time) there is only the filtration rate (ml/time) to dissolve the calcium oxalate salt it will make with the calcium in the filtrate (calcium is about 1.1 mmol/l). where V is urine flow rate, [Ox]u is urine oxalate concentration, g is glomerular filtration rate, and r is the fraction of g reabsorbed back into the blood. where [U/P]cr is just the urine to plasma ratio for creatinine, the marker used here to calculate g.
It is fundamental chemistry that crystals in equilibrium with a solution (at solubility) all have a unique concentration product of their constituent salts – calcium and oxalate in this case. This is often called the empirical solubility product, and for human plasma filtrate (as one finds in PT) the value is 40 x 10-9 M2. The square denotes that one concentration is multiplied by another. M means the units are in molarity. If you divide the concentration product of a solution by the empirical solubility product the result is supersaturation. The concentration of calcium is known to be reasonably constant along the length of the PT because calcium and water are taken back into the blood at more or less equal rates. So the concentration of calcium in PT fluid is the ultra-filterable calcium concentration, [Ca]uf. One can measure that. where [Ox]pt is in micromoles/liter and [Ca]uf in millimole/liter (usual value is 1.1 mmol/l). The lower right panel of the large four plot just above shows PT SS calculated from Eq. 3. But these calculations were limited because we had only estimates of r, the fraction of filtrate reabsorbed by the end of the PT. From published estimates using lithium clearance, we assumed 75% when g was above 60 ml/min and 70% when it was below 60 ml/min. But you can see from Eq. 3 that as r rises near to 1 [Ox]pt rockets upwards, and the same as g falls toward 0. Even so, the estimates make clear that PT supersaturation is a reality when urine oxalate rises. Welcome back. This part is a lot easier and you will enjoy reading it. Here, I have calculated PT CaOx SS vs eGFR for urine oxalate excretions (mg/d) of 30, 50, 100, 150, and 200 (curving lines of increasing height). I assumed values for r, the conservation of water in the PT, at 70 to 75%.. When eGFR falls below 25 ml/min, PT SS rises above 1 for even the lowest oxalate excretions, meaning PT crystals can form as they did in our case. At an eGFR of 60, and an oxalate excretion of 100 mg/d, SS would be present. If diuretics or laxatives raised r, SS could be very much higher. So a fall in eGFR could cause PT crystals that damaged the kidney and lowered eGFR more. I suspect that happened in our case. It would seem that because oxalate is filtered and secreted into the PT and cannot get out again, the fluid in the tubules can supersaturate and create crystals that damage the cells and even plug the entire structure. The main driver is how much oxalate kidneys need to remove. The secondary drivers of supersaturation are eGFR and r. Lower eGFR means less water to dissolve the calcium oxalate salts. Higher r, water leaves PT more rapidly and completely. So anyone with high urine oxalate, from bowel disease, primary hyperoxaluria, bariatric surgery, or even very high oxalate diet has a potential risk of a downhill cycle given serious and sustained dehydration, drugs that would lower eGFR or raise PT water resorption, or underlying kidney disease. Obviously as these factors begin to overlay – someone with reduced filtration who becomes dehydrated for a significant period or takes diuretics – potential risk rises. That is a pretty good summary of how I envision things. Be clear; risk is risk, not reality. People with increased risk may do fine, but wiser ones will avoid risk whenever possible. Can We Prove This Vision is Correct? What follows looks abstract and difficult but is really not. You will enjoy reading how what we only imagined – PT supersaturation from how the PT works – gives rise to predictions in the real world we could actually look for. Here is a perfect case to illustrate all I have written about science. Given the lack of sites elsewhere along the nephron through which oxalate can enter or leave the nephron, that one fact, one gets Equation 3 from simple conservation of matter – oxalate molecules in this case (For special readers: The ‘fact’ includes kidneys neither produce nor degrade oxalate molecules). Equation 3 summarizes the quantitative implications of oxalate conservation and predicts PT supersaturation given conditions of urine oxalate, eGFR and r we can readily measure directly. This prediction is necessary if conservation is true. From the evident crystals and physical chemistry of crystallization we also know supersaturation is present. So, one would seem to be done with the problem. We already knew about the crystals and sought to explain them. We did, with equation 3. That is nice, but circular. 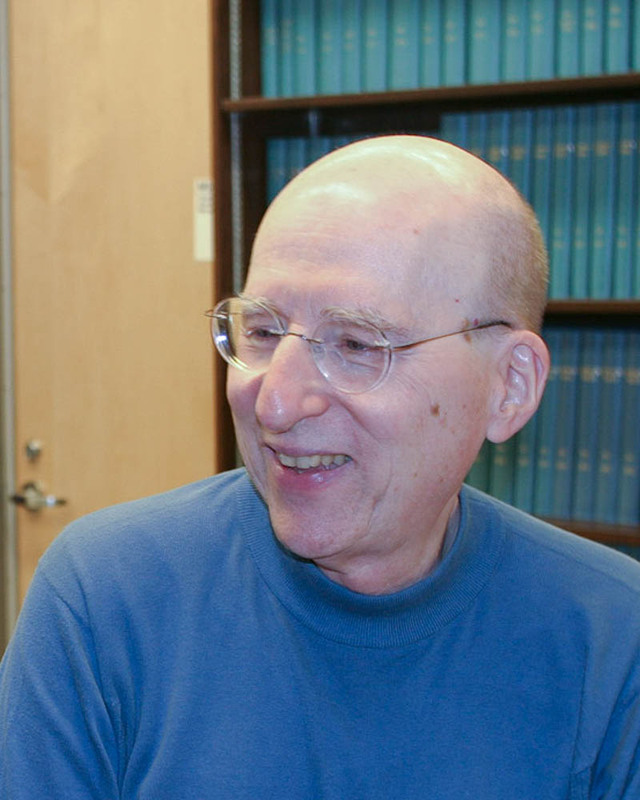 Useful theory predicts what we have never seen because we never looked – novel predictions. So, what does our theory predict beyond that water extraction produces PT CaOx supersaturation? Because oxalate is secreted through the cells of the PT, supersaturation should be especially high in cell membranes. Because the PT absorbs water continuously along its length, crystallization should rise with length, as well. These two spatial selectivities provided us with our first two novel predictions. In tissues from our patient here, I showed several PT cells with tiny crystals in them. These are expected if oxalate secretion is what drives PT crystal formation. The very transporters that secrete the oxalate are on the cell membranes that face into the tubule fluid. Crystals are far more apt to form on a surface – like a cell membrane – than in the flowing bulk fluid within the tubule, especially if oxalate is moving at high concentrations through its transporters in that same membrane. In our patient, multiple tubules were plugged with crystals, so the tiny crystals on single cells could have formed as a secondary phenomenon to plugging. 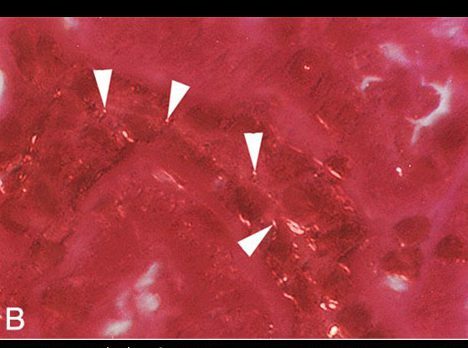 But in our publication, we demonstrated tiny crystals in the membranes of PT cells despite absence of any tubule plugs. 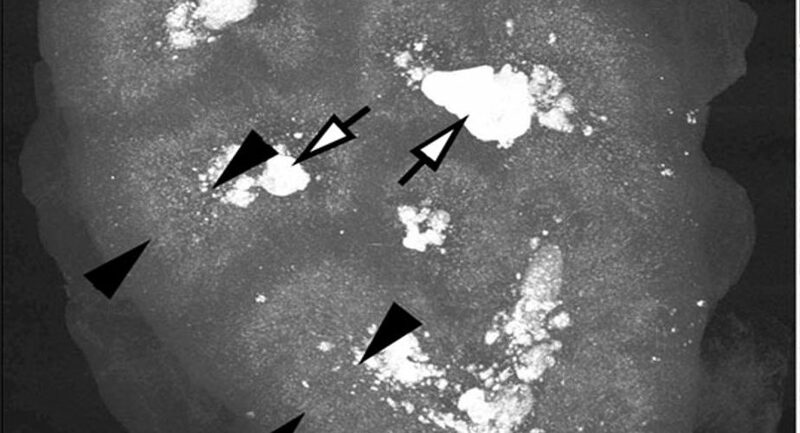 The white arrowheads point to tiny bright dots that are crystals viewed under polarized light. Not shown here, they all stained as well with Yasue stain that is particular to calcium. That double staining marks them as crystals as opposed to other white dots scattered about. The combination of Yasue stain and birefringence in polarized light assures us they are calcium oxalate crystals. Moreover they are in the borders of the tubules (you can see the path of a tubule running downward from left to right under the white arrowheads). This view is at 200 power magnification, the same as that used for the small crescent in the biopsy of our patient’s kidney tissue. But here, these crystals are all alone. No tubules have any plugs in them, and kidney function is reasonably well preserved (creatinine clearance = 78 ml/min). The PT begins at the glomerulus, and proceeds through the cortex. At its end, it becomes straight and plunges into the outermost stripe of the medulla – the so called straight, or S3, segment. This straight segment, being at the end, will have had the most fluid removed back into the blood, and if oxalate is being secreted it will also have the most oxalate compared to the earlier segments. Even more, it passes through the medulla, where the thick ascending limbs are reabsorbing sodium chloride back into the blood without water. Because the salt concentrations outside the S3 segments are higher than outside the earlier segments, water extraction will be even more marked by comparison. In other words, the S3 segment must be the most supersaturated segment PT segment. Given that crystals form because of supersaturation, we should be able to find – if we look carefully enough – that crystals accumulate in the S3 segments more than anywhere else in the PT. To look we chose kidneys from children with kidney failure from PH1 whose kidneys were removed prior to transplantation. They will have formed enough crystals to destroy kidney function, but the kidneys will not have been in their bodies for years of kidney failure that allow crystals to simply fill up of their tubules. This picture is a high resolution CT image of one such kidney. The black arrowheads point to the outer and inner limits of the outer stripe of the outer medulla. That is the precise region the S3 segments pass through. The white arrows point to large deposits and stones filling the papilla and the calyces – where the final urine leaves the kidneys to enter the urinary system. But the most important place to look is not between the arrowheads, or at the tips of the white arrows. It is along the wedges of the left hand black arrowheads, for they lie along the entire width of the renal cortex, where the glomerulae are, and the winding convoluted proximal tubules wend their meandering ways. Our patient had crystals in those cortical convoluted tubules, you saw them. No doubt this kidney has them there, too. But look at the far greater density of crystals between the ends of the black arrowheads than under the bodies of the ones on the left. Do We Have More Predictions? We do, but have not tested them. Right after the S3 segment come the thin limbs of the Loop of Henle – critical to concentration of urine. Water is extracted rapidly as fluid descends down the limbs into the medulla and oxalate cannot leave. So we expect severe crystallization will destroy them. We should look specially for this, and did not. Because these thin limbs are essential for concentrating the urine, we should expect an early loss of renal concentrating power. Such a loss occurs in all kinds of kidney disease, but should be more apparent in states of high urine oxalate, present even when kidney function is normal. We should expect crystal plugs in the distal convoluted tubules. We did not report them, but were not specially looking for them, either. No theory is ever right, merely not yet proven wrong. Filtration and secretion with secondary crystal formation in PT has intuitive appeal and has withstood two critical tests, as I have just shown you. One might say it will therefore do as a basis for proceeding further. But if you are an acolyte of Popper and Kuhn, as I am, you know our theory will not survive. Those who come will surely overturn it, as I have overturned those that came before me. But for now it has enough in it to guide what we say to patients, and to guide what they can do to protect themselves against kidney injury. 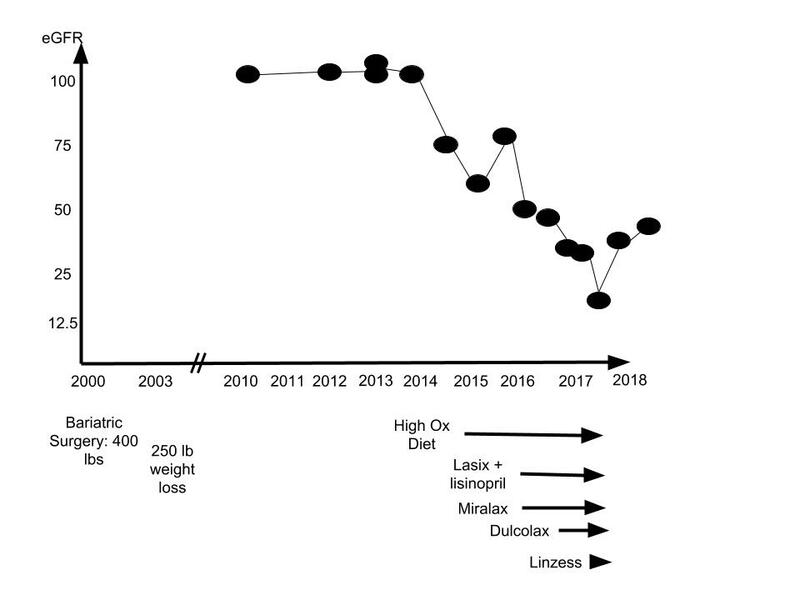 A theory must not only predict but also explain what we found, in this case acceleration of kidney loss with high oxalate diet and use of specific drugs. Such explanation links the new theory with the whole of the relevant knowledge in the field. That is not a test, as no sane scientist would theorize against known facts. It is simply to use theory as explanation in new terms such as factors that affect PT supersaturation. At the top of the figure just below, something raises urine oxalate excretion. In this case it was bariatric surgery, and then addition of a high oxalate diet. To the left we have conventional stone disease with tubule plugging. Higher urine oxalate causes kidney stones, and certainly can do so after bariatric surgery. Crystals typically plug medullary and papillary collecting ducts. One might think the plugs will be pure calcium oxalate, but only in PH1 does this assumption hold. Among patients with small bowel disease and resultant hyperoxaluria, plugs are mainly calcium phosphate as hydroxyapatite, with only scattered traces of calcium oxalate. The same in those with old style ileal diversion. It produces extreme hyperoxaluria but plugs are mixed hydroxyapatite and calcium oxalate. We do not know why the plug crystals are that way. Plugs can obstruct those nephrons they drain leading to damage in the cortex – internal hydronephrosis. One can see such cortical damage in kidneys from animals. In humans with plugging, not from bariatric surgery but from other causes, we found scarring in the renal cortex. A fall in water intake will lower urine volume via the hormone vasopressin. This concentrates calcium oxalate salts in the medullary and papillary tubule fluid and promotes more stones and plugging. Since plugging can cause cortical scarring, we propose it can cause chronic kidney disease (CKD). CKD and even kidney failure are more common in stone formers than other people. 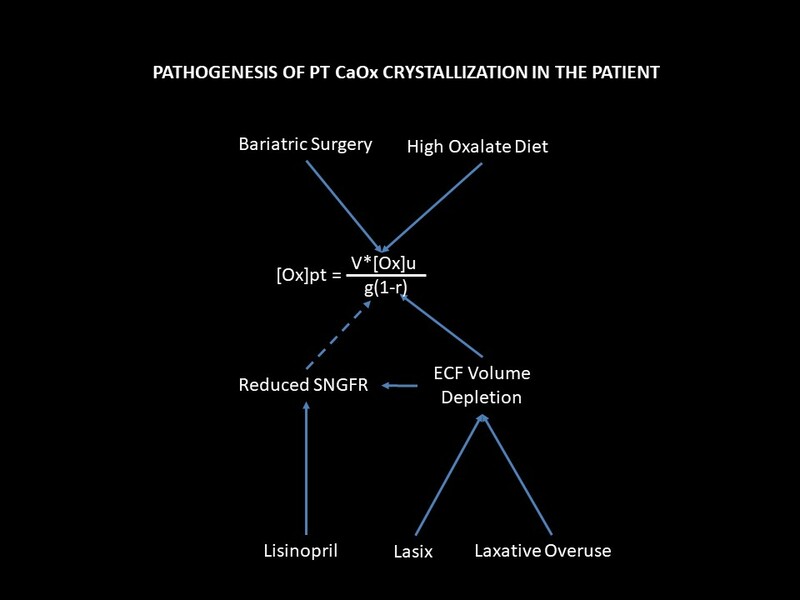 We have theory and evidence that by increasing urine oxalate excretion bariatric surgery will raise PT oxalate secretion and therefore can cause PT CaOx SS and crystallization. In our case we have the crystals to prove it. A fall in ECF volume that reduces g or increases r will raise that SS by reducing the amount of filtrate available to dissolve CaOx salts in the PT. When SS is not very high new crystal formation can be slow and cells adapt by internalizing the crystals and clearing them. I think this may have been the case during the long years of stable kidney function in our patient after her surgery. Even so, one can imagine some cell stress and perhaps cell loss, but likely not enough to cause external evidence of injury. Raise the rate of crystal formation and cells cannot cope. They internalize crystals and become injured. Crystals spread to involve the entire tubule lumen with the resulting crystal plugs our patient illustrated. The outcome is cell loss, inflammation, and possible fibrosis. Any fall in eGFR will lower the amount of filtrate available to dissolve PT CaOx salts. The reason is that secretion will maintain urine oxalate excretion constant. If it does not, plasma oxalate concentration must rise, and that will raise filtrate oxalate concentration so as to increase SS just as secretion would have done. We know what preceded kidney failure in our illustrative case, but need to restate it in terms of our ruling equation and the scheme of injury I just detailed for you. Of course it all began with the bariatric surgery that raised urine oxalate excretion. I know it did so as her urine oxalate was still 87 mg/day when I first made a measurement. The blue arrow attaches the surgery to that component of the equation as a means of raising PT supersaturation. Kidney function remained stable and normal for 14 years after the surgery. I presume that if PT crystals even formed, the cells coped with them, leading to no disease or one so indolent we found no trace of it. Being only an exaggeration of the surgery itself, the diet would simply have increased PT SS and rates of crystal formation. But we did find, looking back, a fall in eGFR from only the diet – if the history is so exact one can tell such fine points. Lisinopril, like all drugs that reduce angiotensin 2 production or action, lowers single nephron GFR (SNGFR) by dilating the efferent glomerular arteriole. If you have not read the parent article the link goes to, this might be a good time to do so. Variation of SNGFR is usually harmless, even beneficial in some cases, but here not when urine oxalate excretion is high. The fall in g must raise PT CaOx SS. ECF volume depletion from lasix and laxatives, the same. Such a fall will reduce renal blood flow and therefore eGFR. Because the usual compensation for such a fall is efferent arteriolar constriction via angiotensin 2, the combination of ECF depletion and lisinopril would have a magnified effect to reduce rGFR, and therefore to raise PT SS and crystallization. These same two drug classes, lasix and laxatives lower ECF volume. To save us from death by dehydration, any fall in ECF volume triggers multiple pathways that actuate renal salt and water conservation. Prime among these pathways, PT reabsorption rises because this segment controls the largest flows of salts and water. If you have any condition that might raise urine oxalate – bariatric surgery, small bowel disease, vegetarian diet, very low calcium diet – be sure your physicians have measured 24 hour urine oxalate excretion. Every calcium oxalate stone former needs such a screening measurement at least once to exclude the rare but vicious genetic primary hyperoxalurias. When present, high urine oxalate poses not only a risk for stones but for kidney damage and disease. Your physicians are responsible for your care, for detecting high urine oxalate, and for treating the condition. But you need to know the precautions you must take if urine oxalate is high. Your physician will tell them to you, so I am just repeating here what you should expect to hear directly. Avoid ECF volume depletion: diuretics, laxatives, very low salt diets – these are not for you unless your physician has made special treatment initiatives to lower urine oxalate. The ACE/ARB drugs may well be used, but with precautions to avoid a marked fall in eGFR. If eGFR falls, one needs to somehow control urine oxalate specially well. Acute GI diseases are usually brief, so keep up some salt and fluid intake. If your urine oxalate is very high and not controlled your physician may prescribe brief at home IV fluids to tide you over. NSAID OTC drugs – like Motrin – can lower eGFR, so be sure your physician has explained to you how you can safely use them. Obstruction from a stone lowers eGFR and raises r, a lot. Your urologist will consider acute obstruction an far more urgent matter in you vs. common stone formers. X ray contrast agents all reduce eGFR, and even though brief the episode might trigger acute kidney injury. Physicians are here to assure you are protected. But they must know who you are and what you have. Records may not always be clear or even present; you are, and can warn them. You do not need me to tell you how to control enteric hyperoxaluria, from bariatric surgery or any other cause. You already know how. Low oxalate high calcium diet, low diet fat intake, oxalate binders if needed, pyridoxine in PH1 patients who respond to it – these things are part of your routine practice. You know to measure urine oxalate in any stone former, and certainly in a patients with any bariatric surgery. You know all about drugs, contrast agents, inter-current illnesses that can lower SNGFR and raise PT reabsorption. So what is there for me to say? The patient who kindly let me use her as an example has physicians, good ones, yet things got by. The oxalate diseases remind me of a policeman’s life – mostly nothing happens, but when it does it comes all of a sudden, with stunning violence. I said that at the beginning, and say it at the end. The ‘opportunity’ consists in the experiences of a person who has consented to appear here – albeit disguised – as a proof absolute of what can happen, and as a warning to us all. I have concealed her so no one save for the rare few can know who she is. But to see rehearsed on a public screen the events of your own life can be no pleasure. That she has given of herself in this regard is a mark of grace. It is a gift to us for the which I offer – so far as I can so presume – our collective gratitude.